The article summarises the thesis in Mitchell and Fazi’s latest book – Reclaiming the State: A Progressive Vision of Sovereignty for a Post-Neoliberal World (Pluto Books, 2017). Who is this Fazi character? An Italian journalist by accreditation. Clearly says a lot for journalistic standards in Italy. The fact that their book was published by Pluto Books is telling – clearly the ideas are from outer space! … neoliberalism was not just a right-wing Thatcherite-Reaganite prospectus. The centre-left, as embodied by Mitterrand’s socialists in France, Blair’s New Labour and the Democratic Party in the US, was complicit in its imposition. So what is so bad about that? The social democratic parties just got real for once and realised that the self-regulating free market would deliver better outcomes for all of us – and anyone left behind was just not willing to work hard enough or take enough risks. Mitchell and Fazi clearly don’t want anyone to take risks and be rewarded. They probably want to equalise incomes – although they don’t say that. But their communist message is subliminal – it is woven throughout the book I am sure. Not that I have read the book. I don’t need to. I remember the famous leadership response of Harold Wilson when he was Prime Minister. 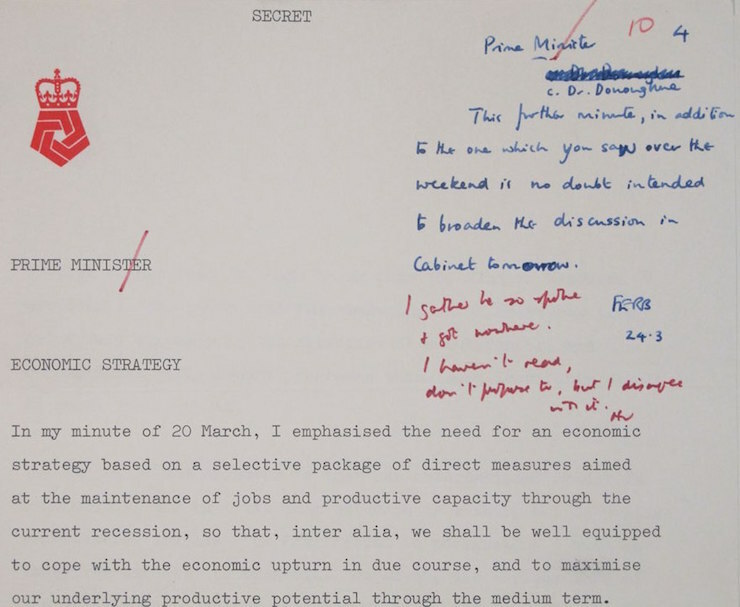 On March 24, 1975, that mad socialist Tony Benn who was unfortunately then the Secretary of State for Industry, sent the Prime Minister with a document outlining the alternative path to austerity and approaching the IMF for cash. The British government had clearly run out of money – it was obvious, Dennis Healey was begging the IMF to loan the government money. That is all you need to know. It is like knowing that the Greek government has failed because its economy is such a basket case. One thing follows the other. Anyway, Benn’s document outlined a plan to impose import controls (particularly on luxury items) and to invest in and revitalise British industry. Here is the front page of the document held in the British Archives (TNA PREM 16/341). Wilson’s annotation is the red handwritten note at the top right hand side. Mitchell claims that response by Wilson is one of the characteristics of Groupthink – denial without consideration. I think it shows leadership. … the government has the power to create “fiat money” – that is money established by government regulation or law as opposed to currencies with intrinsic value, such as gold. That is enough for me. He wants the government to go crazy and go on a spending spree to give jobs to lazy characters who cannot be bothered doing anything productive. And just be warned – hyperinflation follows. I demanded that he explain Zimbabwe, which, as everybody knows, had a central bank running the printing presses as if there was no tomorrow, with the obvious hyperinflation. Tell me about that Professor. Yeh right! He flooded me with meaningless data – such as farm output statistics and historical stuff about the Zimbabwean Land Acquisition Act of 1992 which gave the government the legal right to take control of any land it desired within the nation. That is Communism by any standards. It is largely irrelevant that the previous owners were given financial compensation – by then the value of money was becoming worthless anyway. He claimed that the performance of the economy up until about 2000 provided no sign of the disaster that has followed. GDP growth looked to be like many other nations – variable and usually positive except for the harsh drought in 1992-93. He then said that the problems came after 2000 when Mugabe introduced land reforms to speed up the process of equality. The revolutionary fighters that gained Zimbabwe’s freedom from the colonial masters were allowed to just take over productive, white-owned commercial farms which had hitherto fed the population and was the largest employer. He admitted that from an economic perspective the farm take over and collapse of food production was catastrophic. What has that all to do with the hyperinflation I asked? 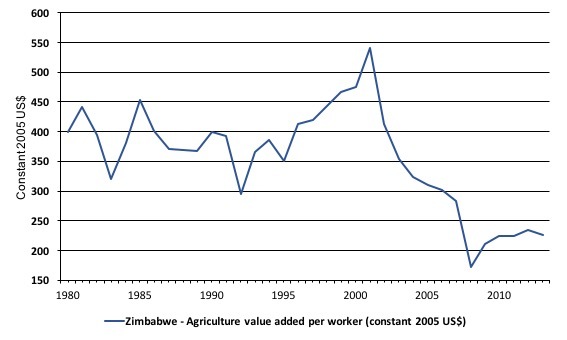 Well he presented me with this graph, which showed Agriculture value added per worker (constant 2005 US$) for Zimbabwe from 1980 to 2013. Yeh, so what? Mitchell keeps going on about being consistent with the evidence. 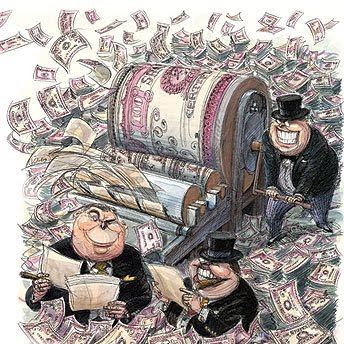 But why all this distraction about farm output – why not just admit that the central bank was printing money like nothing else and that shows MMT is dangerous? So what if farm output, which was a significant contributor to total GDP in Zimbabwe fell by 23.7 per cent in 2002, after the land reforms? And fell by 14.4 per cent in 2003. And by 68 per cent in total between 2001 and 2008? What has that got to do with anything, other than to say that the farmers were lazy and/or incompetent. Mitchell said that the fact the freedom fighters were not very good farmers was relevant but only inasmuch as it meant a massive supply-side contraction in the Zimbabwean economy occurred in a very short time period – he claimed that the speed and depth of that contraction was unprecedented although said that the experience of the Weimar Republic after the First World War was similar – another massive supply-side collapse. Well then he tried to tell me that the initial collapse in farm output was followed by a collapse in spending on infrastructure which further constrained the supply-chain. He said that the degradation of the National Railways of Zimbabwe (NRZ) restricted the capacity to transport its mining export output and in 2007 alone there was a 57 percent decline in export mineral shipments. He referred me to his blog – Zimbabwe for hyperventilators 101 – for more detail. He claimed that Manufacturing output fell by 29 per cent in 2005, 18 per cent in 2006 and 28 per cent in 2007 and by 2007, only 18.9 per cent of Zimbabwe’s industrial capacity was being used. Apparently, the manufacturers blamed the central bank for stalling their access to foreign exchange which is needed to buy imported raw materials to allow production to occur. I knew it. When I read that I knew he was about to admit that the hyperinflation was all to do with the central bank printing like crazy. What? He tried to run the story that the Reserve Bank of Zimbabwe was using foreign reserves to import food, given the collapse of farm output. He said there were other issues like this that meant that even if the central bank could have contracted the money supply and the government had introduced even harsher austerity, the inflation rate would have still be high because the economy’s productive potential had been trashed. He tried to argue that this historical lesson has nothing much to do with fiscal deficits as a means to ensure high levels of employment in a growing economy (where capacity grows over time) where the non-government sector also desires to save. He said that a private sector investment boom would have caused the same outcome both in inflation. All this data and argument … yet everybody knows it was the central bank printing like crazy. And I have a deep suspicion that the data was just made up anyway. I told Mitchell that I had read a Tweet from the “legendary retired chief executive of General Electric” Jack Welch in October 2016 who exposed the way the Bureau of Labor Statistics in the US was deliberately lying about the unemployment numbers in the US to “swing the presidential election in the Democrats’ favor”. Unbelievable jobs numbers … these Chicago guys will do anything. Can’t debate so change numbers. Mitchell told me that there was an interesting New York Times article about this (November 3, 2016) – How Economic Data Is Kept Politics-Free. Everybody knows the national statistical agency data is false. Yet, Mitchell uses it all the time and calls it facts and evidence. Just goes to show how stupid the fellow is. 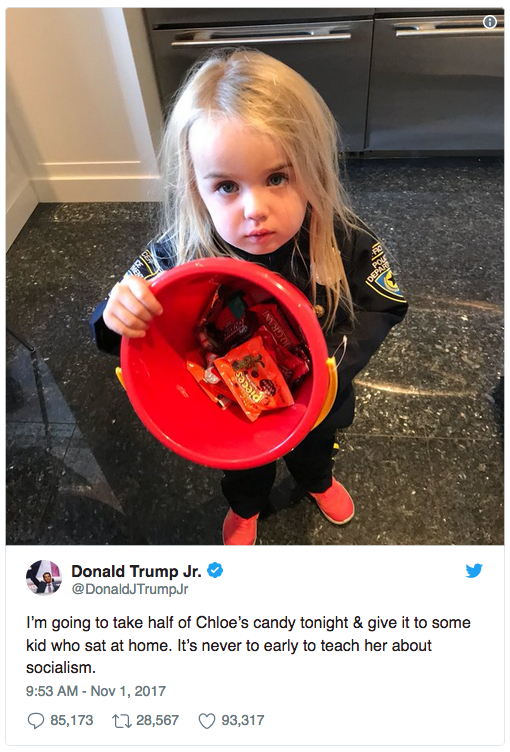 And talking of Trump and his family, Donald Trump Jnr had the right idea when his kid came home from collecting lollies at Halloween – to take half and give them to “some kid who sat at home”. These socialist ideas that Mitchell and Fazi push out, that the government can create full employment by throwing money around – willy-nilly, without regard for anything or anyone just so some lazy individuals who can’t be assed getting out of bed in the morning can get a make-work job are likely to catch on – that is, unless we educate our children early. This Tweet from DT Jnr is gold in that respect. Perhaps we should make this sort of confiscation compulsory in pre-schoolers – to show them the way. Talking about gold – it really is the only safe asset to protect us from these ‘feee-art currency’ types – like Mitchell. The article says that when these governments all adopted the only path forward – neoliberalism – which just put the bosses in charge where they should be and stops unions and commies running the show – bad things happened. I read the article soon after I had re-read Ayn Rand’s Atlas Shrugged, and I don’t mind saying it – for the 12th time. Everybody knows that it is the capitalists who produce the wealth which allows the workers to eat. Rand’s conclusion that “workers didn’t build America … businessmen did” applies to Britain too and all nations. That is why neoliberalism has been good for growth and prosperity – it has put control back into the hands of the rich who are the enterprising souls in our nations and the rest of us rely on their endeavours to eke out an existence. Mitchell responded by claiming that, in fact, British output (and productivity growth) has been consistently lower during the neoliberal era (from the mid 1980s or so). More flaky data probably involved. 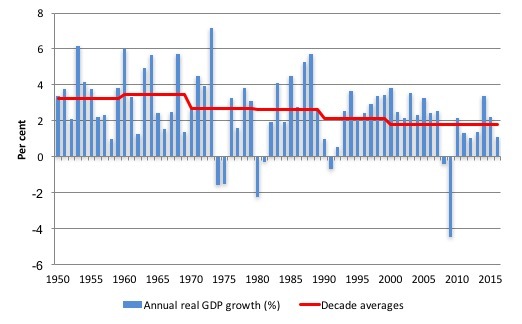 He produced this graph, which shows annual real GDP output growth rates (blue columns) and the decade averages in red. I am not convinced. Everybody knows that these MMT types can twist data to show anything. And if real GDP growth is lower now on average it is because the workers haven’t worked hard enough. … culminated in the decimation of manufacturing, decline of union membership, the expansion of financial services, wage flattening, falling living standards and the privatisation of public services. But total output is still rising and employment is at record levels. So what is the problem? Mitchell responded saying that it means nothing that employment is at record levels because it might only be that the population is at record levels. He claims we have to worry about the quality of work and the rate of labour underutilisation. Well, everybody knows that if welfare benefits were not so high, the lazy unemployed would get off their rears and get a job. The only reason the so-called unemployment-to-vacancy ratios, which Mitchell likes to quote are so high, is because employers won’t create jobs that they know workers won’t take. And then they know that the trade unions are greedy and will demand share in productivity growth for the workers. Why should the workers get a share of the sacrifice that the investors have made in putting in new technology. They should be grateful that they have a job! Mitchell claims that the growing gap between productivity growth and real wages growth, which redistributes national income towards profits is a bad thing and undermines the capacity of workers to continue to maintain consumption growth without recourse to debt. Well that is exactly what the “expansion of financial services” has allowed. Not only does the productivity growth go to profits, which rewards risk, but the banks can now more freely make loans to workers to buy consumption goods and services. That is a win-win in any sense. Everybody knows that. And we all feel liberated by being able to pull the credit card out and max it out. And we all know that if the banks take too much risk – and we end up with massive debts – then the government will try to limit the political damage by rewarding our risk taking with a sort of insurance scheme. Mitchell and co talk about bailouts as if that is a bad thing. I see it as a legitimate use of government money to ensure risk-taking by private investors, who create all the wealth, is properly protected and rewarded. The Independent article provided Mitchell and Fazi’s weird take on this question of government involvement. Mitchell and Fazi point out that the notion that neoliberalism is anti-state is a misconception. In fact, the state has been essential to the neoliberal project as became evident in the aftermath of the 2008 financial crisis. The state is not only required to bail out corporations and banks but to create new markets and in an authoritarian mould to police its citizens. Not a bailout – rewarding risk-taking. And the creation of new markets is about the introduction of free trade agreements, which Mitchell and Fazi oppose. They think that private companies that make all the wealth and which are negatively impacted by changes in national policy at the whim of governments should not have access to a judicial means of resolution beyond the legislative remit of government. These Investor Dispute Settlement Mechanisms are essential to ensure companies can invest. Mitchell and Fazi think they subvert the sovereignty of the nation. But everybody knows that we cannot trust the government to do the right thing by companies … I mean society … which when I think about it are one and the same. In effect, the usual dictum of “tax and spend” is inverted to “spend and tax” with spending stimulating jobs and growth, which can later be taxed. Taxation is not therefore a way of raising revenue but a tool for either controlling the money supply or shaping policy through incentives … Public spending cannot be unlimited and must be commensurate to the capacity of the economy amongst other things in order to avoid hyper-inflation. There it is. He is finally ‘fessing up’ – public spending causes hyperinflation. Everybody knows that. According to Mitchell, sovereignty is absolutely fundamental in order for countries to exercise power over their money creation. As long as a country has its own central bank and currency then it is free to spend. Free to spend. Get it. Free to crank up the printing presses and go crazy. I saw this cartoon once and it is true – everybody knows it. Mitchell tried to tell me that governments do not spend by ‘printing money’ but rather just adjust bank accounts with numbers. But I know as anyone in the street knows that they just want to print more and more. That is at the core of MMT – they want the government to go on a spending spree and just ignore the inflationary consequences. They hide that by saying that “public spending cannot be unlimited and must be commensurate to the capacity of the economy” which is just a smokescreen that I can see through. And everybody will see through it. It is code for spend like a drunken’ sailor – throw money at lazy people who cannot be bothered finding a job. Throw money at public schools that teach socialist doctrines – you know about inequality and stuff like that. Throw money at public hospitals so that people can receive unlimited health care without having to pay for it – that is the quickest way to encourage waste and bad behaviour. People know that they can just get sick and no matter what their income is they will get some care. Where is the incentive to stay healthy in that sort of system. … debunks the idea that governments borrow money from international markets and with it the notion that they are hostage to the market. Well where the hell else do they get the cash from? Does he really think we are that stupid? How come China has all those US government debt bonds or whatever they are called and the US government is spending the Chinese cash? How does he explain that obvious point? Well he tried to claim the Chinese doesn’t issue US dollars and that only the US government issues US dollars so that it cannot possibly be funded by the Chinese. I don’t buy that, not that I understood anything he said about this – all this talk about trade surpluses accumulating financial claims in the currency that the deficit country issues, and then allowing the surplus nation to use those claims (say, US dollars in the first instance) to purchase US dollar financial assets etc ad nauseum. As if that tells us anything. How come the Chinese can loan the US government money that is what I want to know? Mitchell told the journalist that Jeremy Corbyn should not worry about international capital markets because Britain could impose capital controls if it wanted to. That gets to the nub of my worries – socialist governments stealing hard-earned cash from investors who actually have some get up and go. He claimed this would only constrain so-called ‘hot’ money, that he claims serves no productive purpose anyway and just amounts to casino-like behaviour. See, that confirms my suspicions – he wants us to have no fun – he wants to create monolithic governments that boss us around and stop us enjoying ourselves. He probably supports North Korea. And finally I was sickened to read that Mitchell and Fazi support the Brexit outcome. They don’t even live in Britain so should shut up and keep their stupid ideas to themselves. Why does a character like Mitchell get any airwaves or coverage in the media. I am a libertarian who believes in freedom but I would stop these dangerous and stupid MMT ideas from spreading. Everybody would! Classic writing from a highly knowledgeable guy. You should let him write more often – he obviously knows what he is talking about! I have been reading your articles for a long time; never have I seen satire from in you. This was brilliant. The irony (unfortunately) might be lost on some of my contacts and friends. Would you write straight as much as you do economic theory. Perfect, lots of quotes the mainstream media can now use in your name to debunk this crazy MMT stuff! Oh, and it’s obvious that Mitchell and Fazi work for Russia! As of right now already 2K. I see the neoliberal narrative starting to collapse and perhaps collapsing in next 10-20 years. There are going to be big changes in geopolitics IMO. I don’t see euro or EU surviving. I watched youtube video where you were talking about that most progressives being neoliberals. Seeing Warren’s video from MMT conference also, It seems that attention is given to framing. I think it is a good strategy. It isn’t just that satire is a misjudged weapon – there are many concerns on both sides of the ideological gulf that represent legitimate alternative perspectives; the process of capitalistic competition has primarily been utilised in resolving these historically. Replacing that process with something more appropriate requires the same scope and authoritative examples with which MMT has been promulgated thus far. Which for me comes down to “There is no hippopotamus in this room at present “. I’m really really happy about the Independent article. Well done. Unbelievable. Robert Rubin (former secretary of the US Treasury, known mostly for neoliberal ideals and making millions off his stint at Citi bank) must be reading your blog- here’s an op-ed from him in the New York Times which sounds a whole lot like the Job Guarantee. I really cannot believe it and am at a loss to explain it. But what the hell- its a good thing. I read the same article, felt the same sense of desperation, tried to respond and couldn’t get a leg in the door. That must have been cathartic, Bill! You talked about how language gives people misconceptions about how the monetary system actually functions because we think in terms of language. we are not being dishonest by using an alternative phase there because it is actually what is going on when government does useful things by giving people funds and purchasing goods. It seems that whenever we say “give NHS more money.” I feel like it’s implied that NHS will not know what to do with it and will certainly waste it on bureaucracies. I feel that it also imply that NHS has overspent in the past so now we have to give it more money! What are you going to do! Those damn doctors! Give NHS more money sounds irresponsible. It’s almost like NHS won’t use that money to hire or purchase goods created by people’s hard work when it most certainly will! It goes back to the human language association thing you talked about. Typically, when parents say “let’s give Ken more money.” Its usually in the context that the kid has overspent or has misspent his allowance. I don’t think I am reading too much into it. There is a language & experience glitch that humans have that put together things that aren’t comparable. You were right, I think that one can get further politically by saying investment instead of spending money. In everyday life, many people don’t think about effort and work hours that are put in by other workers to create the goods we buy. For us, its like money turns into product. We don’t appreciate the work that was put into making a gizmo we get. We tend to forget that some people have to make those things. We don’t think about public & private investment that make the gizmos possible. And so on. It all looks quite consistent with what Bill Mitchell writes, wouldn’t you agree? I warned you guys. When the truth runs against the wealthy and the powerful, the wealthy and the powerful step on the truth. Don’t expect anything from the media. Everyone there knows who they’r working for – corporations, business owners – the people who advertise their wares. Don’t expect the media to undermine the economic position of their employers. Anything incongruent with their illusions and deceits will be attacked.